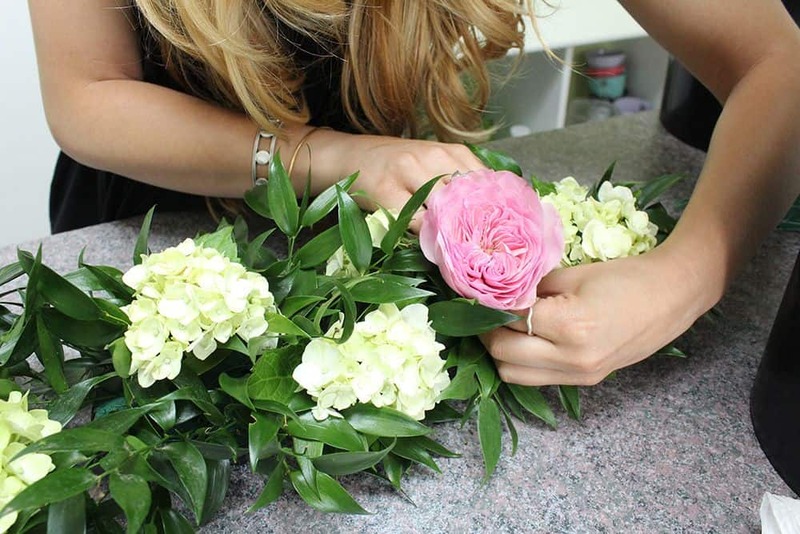 Learn how to make a flower garland with this easy tutorial! 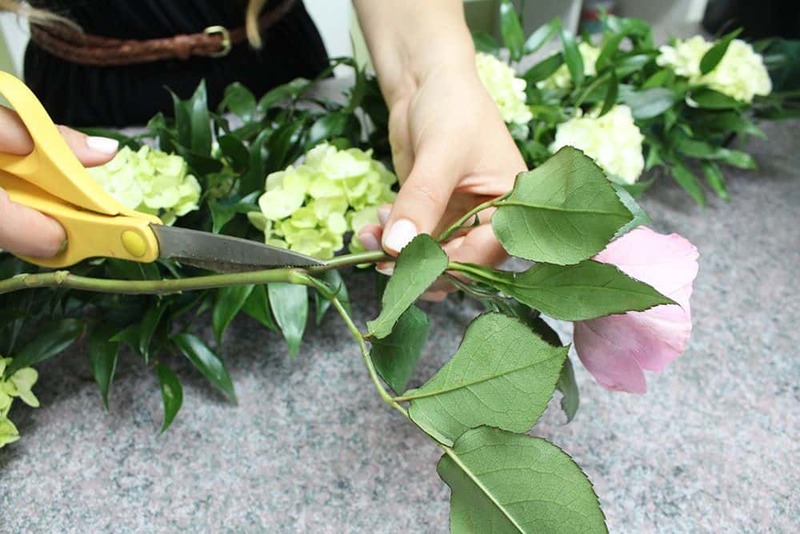 We’ve had so many requests for help creating garlands for weddings and other events that we put together these step-by-step instructions to show you how. For this garland, we used Oasis Garland, Italian Ruscus, Hydrangea Mojito Green, Garden Rose Baronesse Hot Pink, Rose Creme de la Creme, Purple Statice, Purple Limonium, Gypsophila (Baby’s Breath), and Tree Fern. 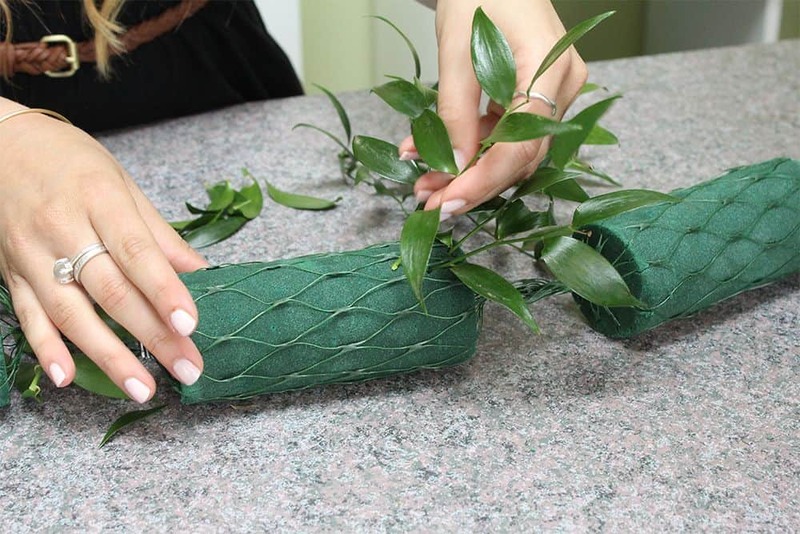 To being making your flower garland, cut the foam netting to the desired length (for this tutorial we used 4 cylinders). Once you have your desired length, drop the foam into a bucket of water big enough for the foam to fill and become fully submerged. After all of the foam cylinders are submerged, pull 0ut the garland and allow some of the excess water to drip off. 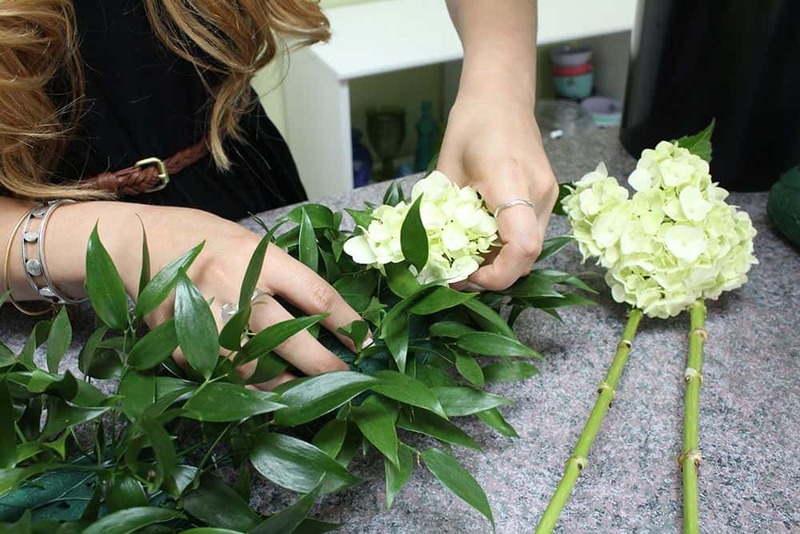 Start your floral garland by adding shorter sprigs of greenery to the foam. 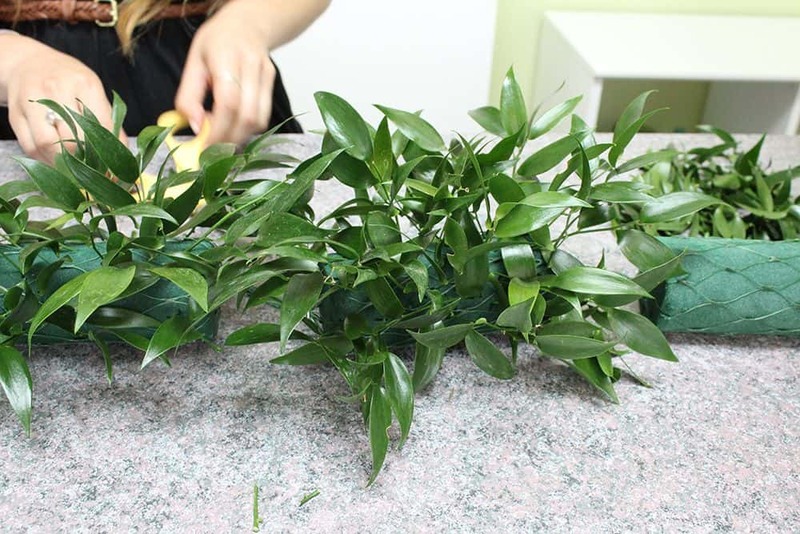 Put the pieces in at an angle (shown below), so the garland looks like it is laying down and so that you cover the connecting netting. You do not need to rotate the foam cylinder to cover the full surface area around; there will be a strip of empty foam that is uncovered where the garland will rest. Continue adding the greenery to each of the foam pieces until they are mostly covered (shown below). Now add the larger featured blooms! Because hydrangea heads are so large, we cut the large blooms into pieces. Then place the smaller sectioned pieces throughout the garland. Now it’s time to add the garden roses. Cut the stem, leaving 2-3 inches under the bloom. You can prune the cut stem or leave on the roses leaves. We chose to remove them. Stick the roses in the foam in between and across from the other featured bloom. Then go ahead and fill in the spots where there is visible foam. We used roses for the bigger spots and our fillers for the remaining areas. Want some more texture? Add in a few pieces of fern. A garland this size would look great on a head table or as a substitute for a vase centerpiece. Drape the garland over an arbor for a wedding ceremony. Or attach it to the back of some chairs to add an extra romantic touch! So what goes on the bottom part of the Flower garland (the side that sits on the table)? Louise, that part can be left alone, so just the foam would rest on the table. If you put enough greenery on the sides you will not be able to see the foam. But if you wanted, you could stick some greenery in the foam on the bottom and have the garland rest on the greens. This is how you do a wedding with $100? I see! Will the foam hydrate the flowers enough if done the day before? Yes it should, as long as the garlands are stored in a cool dry place. Will the garland damage a wood table that it rest on as the oasis remains damp. How far in advance can you make if you have a refrigerator. I need to make 9 garlands for a tables that are 40″ x 96″. Any professional insight you can share with me is greatly appreciated. Mary Jo, we have not seen damage to a wood table from the damp garland, but it is safe to say damage may occur based on the amount of time the garland is left on the wood surface. We would also say it is safe to make them two days in advance, but we would normally recommend the day before. What greenery will cover the most amount of space with the least amount bought? Cheri, Pittosporum would probably cover the most space. The next best suggestion would be coffee foliage. How many stems do you recommend for a 12 foot garland? Hi Caryn! In the garland we created here, we used per foot approximately 2-3 stems Italian ruscus, 2-3 stems garden roses, 2-3 stems 60cm roses, 6-7 stems purple statice, 2-3 stems purple limonium, 1 stem baby’s breath, 3 stems of tree fern, and about 1.5 stems of hydrangeas. Hi ladies! Would you mind sharing the dimensions of the foam pieces? Thank you! Hi Mary! The dimensions of the foam used in this garland is approximately 4.5 inches in length and 2 inches in width. Let us know if you need help with anything else! Would this be the same procedure for cascading floral runner that goes from table to floor? Hi Matilda! Yes, you can certainly use this method to create a cascading floral runner from table to floor. 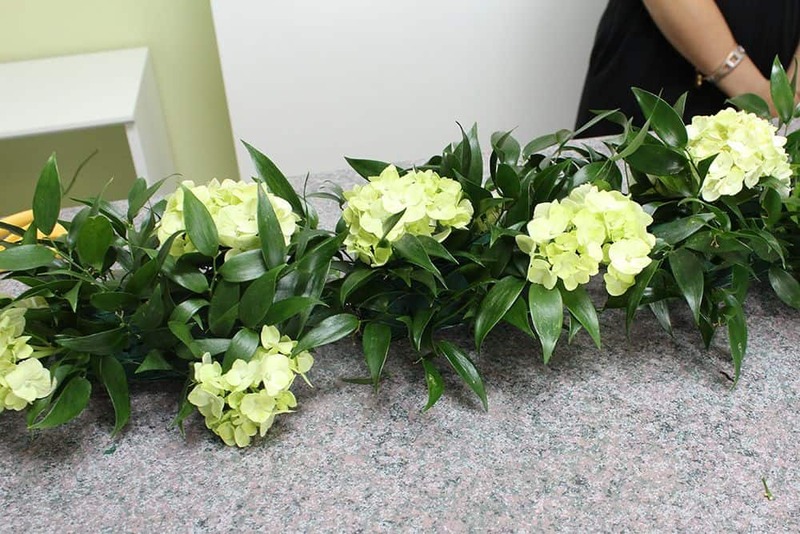 Another method is to purchase pre-made garlands seen here. You can wire flowers onto this garland to add your own unique touch! Hope that this helps! I plan on ordering the garlands already made and adding hydrangea and roses for an October wedding. Do I need to use water tubes before wiring in or do you have another suggestion? Hi Cathy Anna! I would recommend to keep water tubes on the flowers especially the hydrangeas which are very water sensitive when wiring them to a garland. Keep the flowers in water until you are ready to arrange them. I hope this helps! Hello, if I made one of these, how could I attach it to something – e.g. a metal arch? Hi Jasmin! To attach flowers or a garland to a metal arch, you can use floral wire. This wire can be wrapped around any surface for a tight hold and the flowers will cover the wire from view. I hope this helps!! Hi Lee-Anne! You can attach a garland to your curtain/draping with either floral wire or perhaps lay the garland across the curtain rod. I hope this helps! Instead of making a traditional wedding arbor with garland, we are using a tree as our ‘arbor’ and would love to drape our garlands along the trunk and up onto one of the big overhanging branches. How would we hang our garland up along the tree so we don’t damage the tree? Thanks! Hi Kay! That sounds beautiful! I would recommend wiring the garland to the tree trunk. 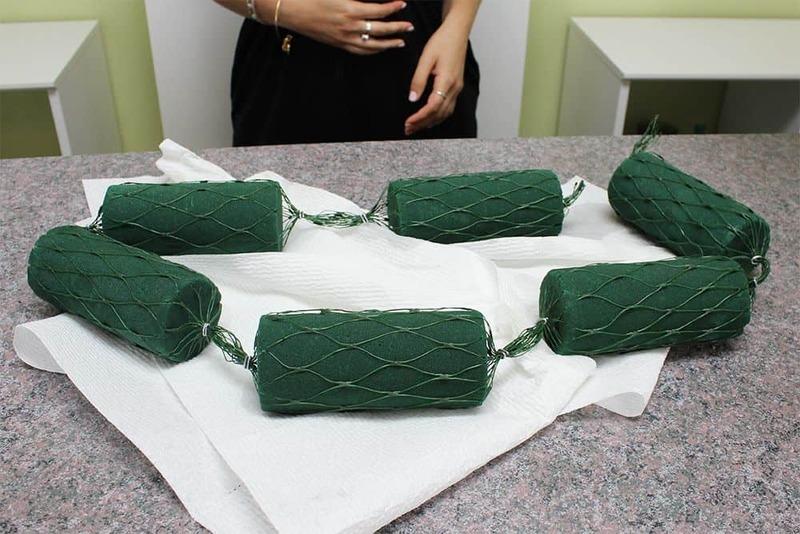 You can purchase floral wire and simply wrap the wire around the trunk, hiding the wire with greens. It should secure quite nicely! I hope this helps! Hello could you please tell me where to get the foam netting. 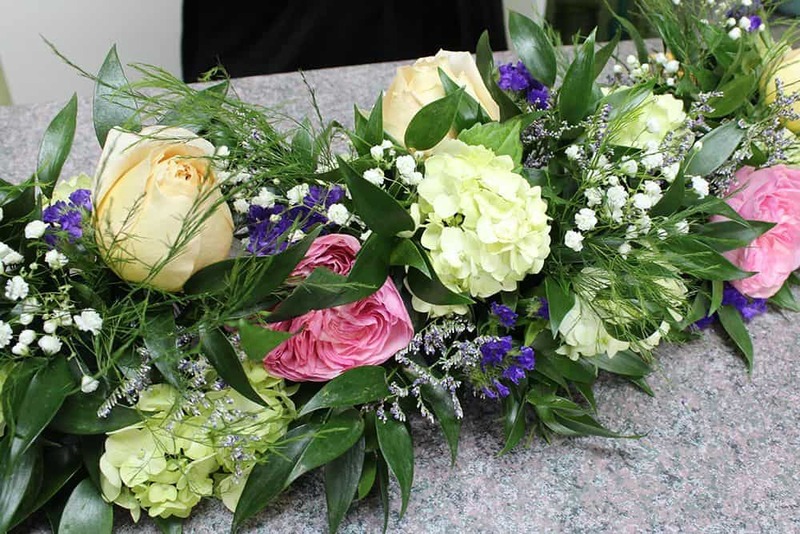 Could you include a link or the name of the floral supply company. I have been searching but can not find any. Hi Lucinda! You can find the foam garland here! I hope this helps!! Hi, I would like to decorate a bird house with a flower garland, do you have any suggestions for me this is for a church festival? Hi Liz! I would suggest wire flowers and greenery together as full-sized garland would be quite large and heavy to hang on birdhouses. You can always attach water tubes to the flowers to help ensure their freshness throughout the event! How much does something like this cost to make? It really depends on what flowers (and how many of them) you choose to include in the garland. If you create the garland with just greens and few flowers tucked in, it can be very cost-effective. This particular garland has a lot of different types of flowers in it (hydrangeas, garden roses, limonium, etc. ), which can add up if you’re making multiple garlands. If you know what size garland you’d like to make and specific flowers in mind you can send us an email and we’ll be more than happy to give you an exact quote! 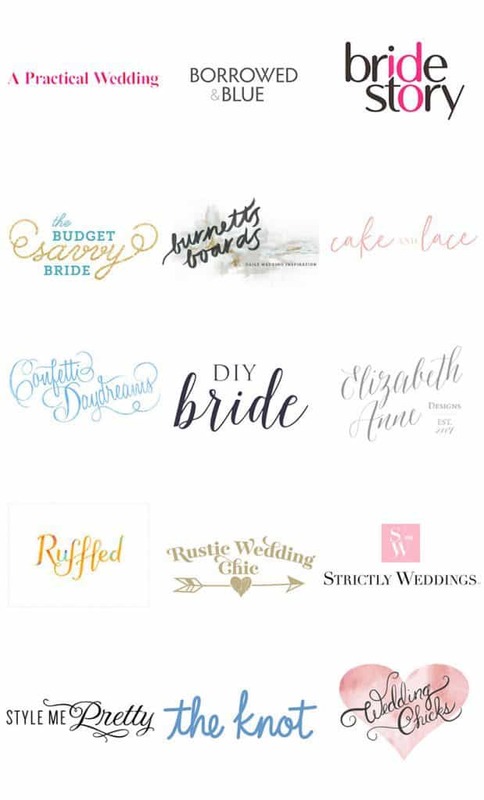 Hi – how far in advance do you recommend making? 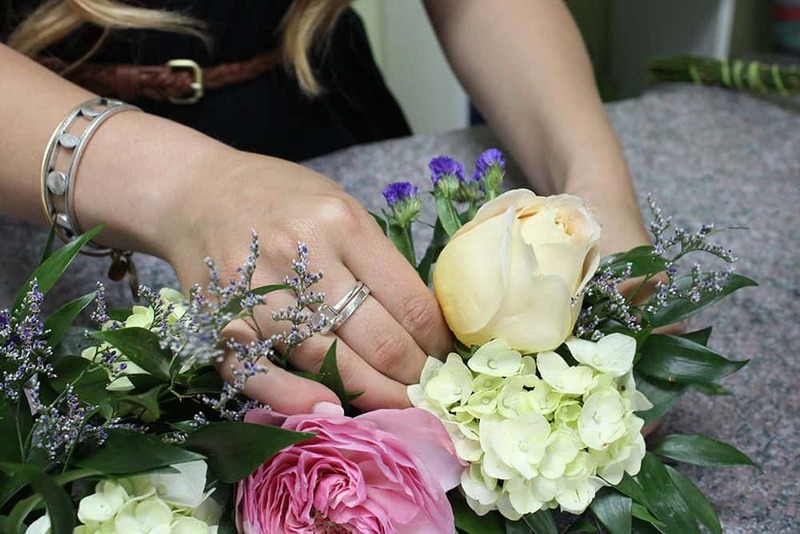 And how do you keep the flowers fresh once they are inserted into the foam until your event? I plan on using individual pieces of the garland & attach each section to a grape vine garland – it will be attached to an arch for a wedding. Thanks for reaching out! 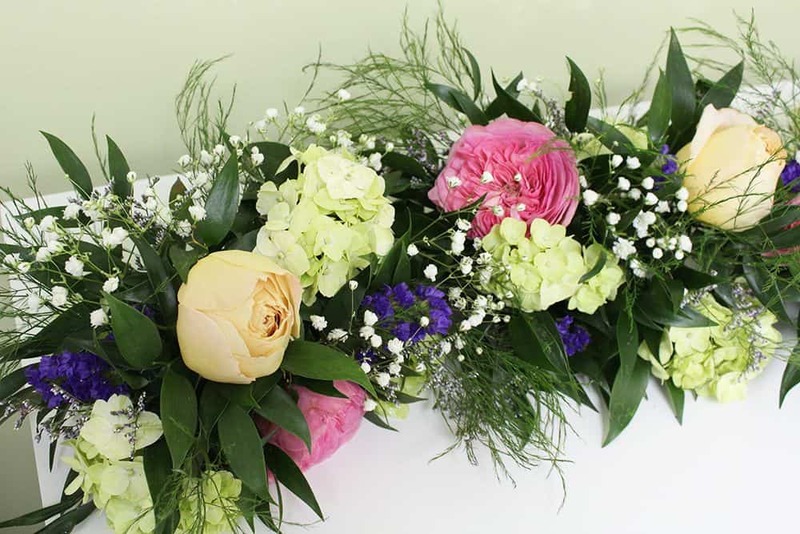 We usually advise that you have your flowers delivered 2 days prior to your event so they have time to rehydrate and so you have time to create the arrangements. So you’re going to want to soak that foam in water and let it absorb enough water to keep the flowers and greens hydrated after you stick them in the foam. If you don’t plan on using the garland foam, most greens will stay fresh if you mist them with fresh water regularly and you can use water tubes for any florals. Hi Did you use water tubes for your flowers and extras? Thanks for reaching out! So this garland uses floral foam (which we soak in water) to keep the flowers and greens hydrated. However, you can use water tubes to keep blooms hydrated if you decide to wire your garland instead. What type of netting is used to hold the floral foam together? Hi Jasmine! This garland comes pre-made with the netting already included! You can find it here! Let me know if you have any other questions! Hi…I am making a floral garland that will need to be attached to a church Entrance…either stone or brick wall. How would I attach this? I don’t think there are any existing hooks. Thanks for your help. Hi Emma! Perhaps you can purchase hooks with an adhesive backing that is able to stick to a wall of either brick or stone. Then you can attach the garland to that. We hope this helps!! Hello, Thank you so much for creating this garland, and I am more thankful for finding your page. My question to you: I would like to decorate a sweetheart table with the garland hanging on both ends of the glass table, which foam do you recommend I use to create this look, where I create fullness from the top edge to the bottom? Hello, I would recommend using the oasis garland foam to create a flower garland. Depending on how long you need the garland to be, you can attach more or cut some of the sections off! I hope this was helpful! I have to make a 4 feet garland with tulips. Would water picks be better for the tulips. Their steams are so hard to put in oasis. They just want greenery and tulips. How many tulips would you use and their cost. Thanks! !